“Microsoft office upload center found a problem while accessing the Microsoft office document cache” the basics. It may happen that when you upload a Microsoft Office file you receive an error message that your Microsoft Upload Center has an error with the Office Document Cache. The Upload Center indicates in the error message that you can try to restart the Upload Center, and if the error message keeps coming back you can completely remove the Cache. Personally, I never delete the cache directly. I move it so that I can always put it back if problems arise. Below the error message is a short manual with screenshots that describes how you can solve this problem. 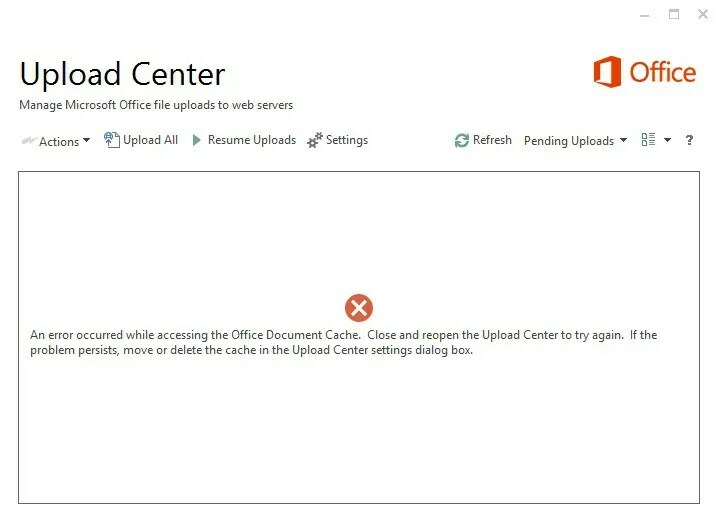 Microsoft office upload center found a problem while accessing the Microsoft office document cache. Let’s fix “the Microsoft office document cache encountered a problem”.. the tutorial. 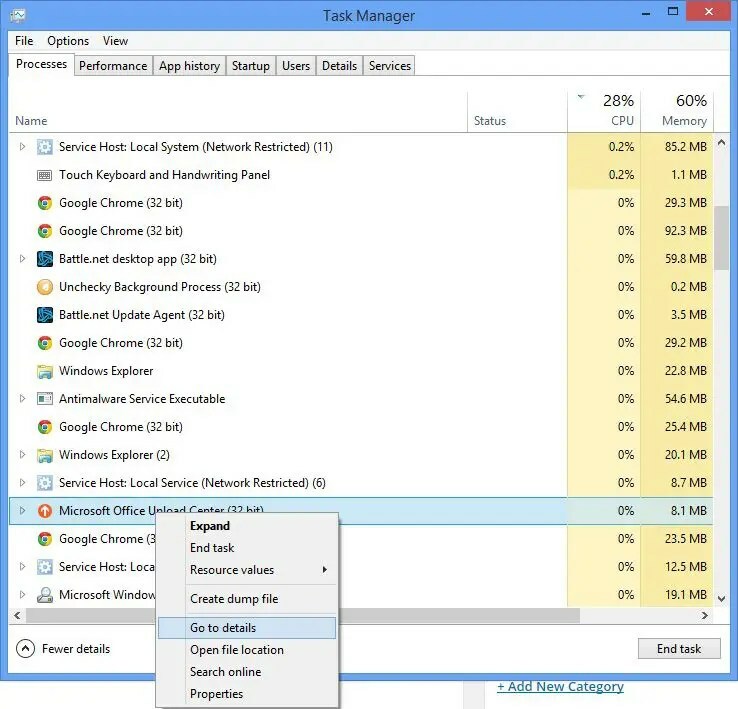 Right click your taskbar and click on Task Manager, or press CTRL + R simultaneously, type in tskmgr.exe and click OK.
Keep the Processes tab open, sort on Name, and search for Microsoft Office Upload Center. Right click on Microsoft Office Upload Center and click on Go to details. An error occurred while accessing the Office Document Cache. Close and repon the Upload Center to try again. Here you can see all the processes that the Microsoft Office Upload Center uses. 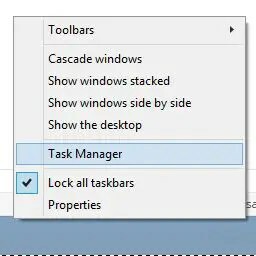 Click the Process and click End task. Make sure to kill all tasks that has something to do with the Upload Center. You can copy/paste this path if you’re using Microsoft Office 2013. 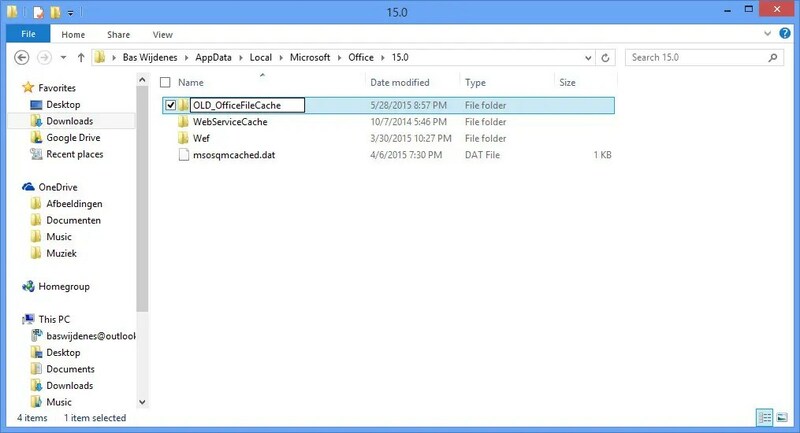 In this directory you will see a folder with folder name officeFileCache rename this folder to for example: OLD_officeFileCache. If you click on the folder you can use F2 to rename a folder name. Do not delete the folder (yet). Now restart your computer and check whether the Upload Center is re-creating the folder. If it is re-created and your problems are fixed you can delete the old directory. The Microsoft Upload Center found a problem while accesing the Microsoft Office Document cache and needs to be repaired before it can continue. Do you have any questions, comments, or other ideas? Then let me know in a comment below. It usually fixes the issue for the first time after reboot, but the error is occurring again even after a new folder of OfficeFileCache is recreated. What should be done? Should I go ahead and delete the old folder and retry? 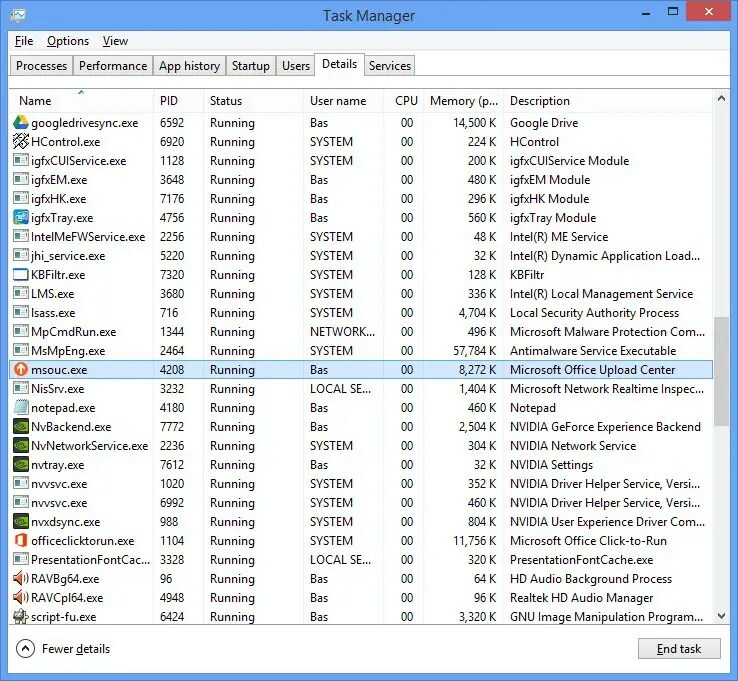 Also, i did not find any msouc.exe running in task manager, hence i skipped that part. Any suggestions?? It worked for me with Win7 Office 2016 (migrating from Office 2013). Forgot to mention that I did the “folder renaming” for both cache folders (Office 2013 and Office 2016). I’ll add this to the tutorial, thank you. This worked – the MSFT help tells you to use the Settings dialog in the Upload Center app, but apparently things were so screwed up that it couldn’t even launch that – it would just hang. So I killed MSOSYNC (the name for the upload app) using Task Manager, and then deleted the files in %userprofile%\AppData\Local\Microsoft\Office\16.0 (note it is 16.0 for Office 2016) – for me, these were named OfficeFileCacheN where N was 3, 4, etc. I just nuked all of them and then it worked. Hi, I have a problem with upload center, it says Upload Pending. When we upload to the cloud it happends, but on our own network we do not have a problem. But this is really annoying because when your upload is pending and someone else opens the file, and then he saves it. the other person did not get the changes from the other user. It doesn’t happen to all the files. Is it maybe a problem because the people open up a file at the same time? I didn’t think that was possible.. IT worked for me on Windows 10/MSO 2016 Pro. I came through step 5. But the file you mentioned by step 6 I couldn’t find it. I work in Windows 10. Do you know where it is? I have the issue with Office 365 by using One drive. Maybe this will solve your problem. You need to enable the hidden files and maps in control panel and then map options. I can’t find the file you named by step 6 in Windows 10. Do you know where it is? I have the issue with Office 365 by using One drive. Look at %userprofile%\AppData\Local\Microsoft\Office\16.0 and look for OfficeFileCacheN where N is a number. He calls it OfficeFileName but that is a typo in the post – it is OfficeFileCache. Hey Mike, Thank you for pointing that out. I’ll fix it. The screenshot shows the right name. Thank you fixed my issue with Office 365 and OneDrive as well. Thanks for your advice. Issue solved. Office 365 / OneDrive Business / Windows 10 . I have this issue on a terminal server, so all users are receiving the error – any ideas? Thanks for your guideline. I tried those steps one by one twice but the problem still occurs. I’m using Office 365 & onedrive for business from my university. Is there maybe something that I missed? Whats the file name, and is it a large file?